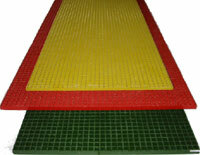 ChinaGrate offers its molded grating lines in a choice of five resin systems, assuring a resin system suited to the unique requirements of each custom application. VE is a VINYL ESTER system specifically engineered to provide premium service in highly corrosive environments. It utilizes an advanced resin system which delivers outstanding resistance to a wide range of harsh corrosive environments ranging from acidic to caustic, plus a high degree of solvent resistance. It has a Class 1 flame spread rating of 25 or less according to the ASTM E-84 Tunnel Test Method. XVE has all characteristics of VE, and offers a flame spread of 10 or less on ASTM E-84 Tunnel Test. IF is a premium corrosion resistant ISOPHTHALIC resin system selected for outstanding acid resistance. It has moderate resistance to caustic and solvent environments. It has a Class 1 ASTM E-84 Tunnel Test flame spread rating of 25 or less. It's more economical than types VE and XVE, and more corrosion-resistant than OR. So far, it's our most popular resin system. FF is an ISOPHTHALIC resin system designed to meet corrosive conditions commonly found in meat production, food processing, bottling and brewing applications. It has a flame spread rating of 25 or less. OR is an ORTHOPHTHALIC resin system designed for mildly corrosive environments. Best suited to replace metal gratings that require maintenance to keep up an aesthetically pleasing appearance. It has a Class 1 ASTM E-84 Tunnel Test flame spread rating of 25 or less for indoor use. It is more economical than type IF or VE.